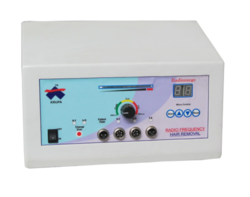 Being a client centric firm, we offer to our clients superior range of Radio Frequency Cautery, which delivers radio frequency (3MHz) wave for cutting & coagulation of soft tissues. The product is manufactured using superior quality raw material and is widely demanded these days. 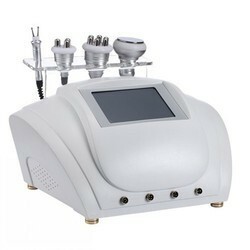 These radio waves are used for vaporizing the cells without applying any pressure on the tissue. They are widely demanded these days and are available to our clients at very reasonable rates. The product is quality tested before delivery to the customers to ensure 100% client satisfaction. 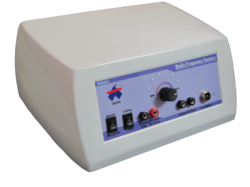 We are the leading manufacturer and supplier of high quality Radio Frequency Cautery 4.1Mhz. It is manufactured under the supervision of our expert professionals who expertise in this domain and are widely demanded these days. It removes unwanted hair for good and is very less painful. Tweezers are used instead to make the procedure safer and provided to our customers at very reasonable rates. 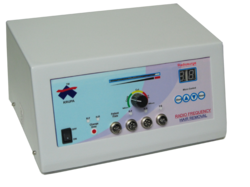 Offered by us is a wide and exclusive range of Radio Frequency Cautery Machine to our clients at industry leading prices. These products are manufactured using high quality raw materials procured from the reliable vendors of the industry. Every product is manufactured under the surveillance of industry set quality standards and are widely demanded these days. Our customers can avail these products from us at very reasonable rates and within the specified time frame. We are one of the leading manufacturers and suppliers of high quality 3 Mhz Non Ablative. The products are manufactured under the surveillance of our expert professionals and are designed very carefully keeping in mind the latest market trends These are the most suitable and manufactured using high grade raw material and latest technology. These are offered at affordable prices and are widely appreciated by the customers. Categories Cutting Instruments, Holding Instruments, Haemostatic forceps, Retractors, Accessories And Implants Application ENT Surgery, Diaganostic Surgery, Orthopedics, Dentistry Type Non-Disposable Automation Grade Automatic, Semi-Automatic, Manual. We are one of the leading manufacturers and suppliers of high quality Radio Frequency 4.1 MHz Ablative. These can also be customized as per the specifications of our clients and are easy to use, optimum performance and reliable. We quality test the product on various parameters to ensure its compliance with industry set quality standards. The product is available to our clients at reasonable rates within the specified time frame. 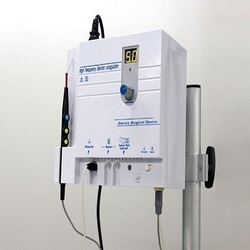 We are among the trusted names engaged in supplying and exporting a broad range of Radio Frequency Surgery Unit (Ablative With Hair Removal) to our clients at industry leading prices. These products are manufactured using high quality raw material and latest techniques evolved in the industry. The product is available to our clients at very reasonable rates and within the specified time frame. 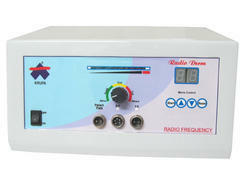 Offered by us is a wide range of Radio Frequency Surgery Unit (3 Mhz Non-Ablative). Precisely processed under the able guidance and expertise of our vendors, these machines are demanded widely by the clients and are appreciated for their high quality and optimum performance. These are delivered to the customers within the specified time frame and at very reasonable rates. 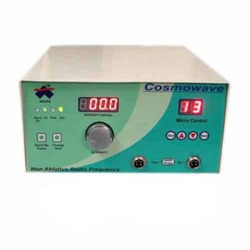 We are the leading manufacturer and supplier of high quality Radio Frequency Cautery 4.1MHz.It is manufactured under the supervision of our expert professionals who expertise in this domain and are widely demanded these days. It removes unwanted hair for good and is very less painful. Tweezers are used instead to make the procedure safer and provided to our customers at very reasonable rates. 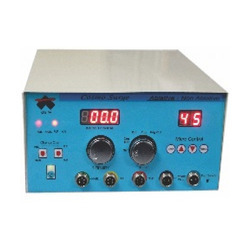 We manufacture as well as deliver Cautery Machine. It is an appropriate model with an effectively low cost. 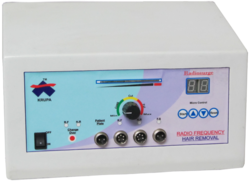 We are among the trusted names engaged in supplying and exporting a broad range of Radio Frequency Systems (Ablative With Hair Removal) to our clients at industry leading prices. These products are manufactured using high quality raw material and latest techniques evolved in the industry. The product is available to our clients at very reasonable rates and within the specified time frame. 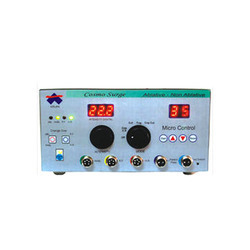 We are leading Manufacturer in Radio Frequency Cautery. We hold all the aces in designing and developing the best RF Handpiece. These products are developed using supreme-grade basic material with advanced technology. Our products are widely appreciated for their longer service life and efficiency. To cater to the diversified demands of the clients, we offer these products in different specifications.